Dreamcatcher cabin is an exqisite log cabin with an incredible view on 7 acres allowing for plenty of privacy. 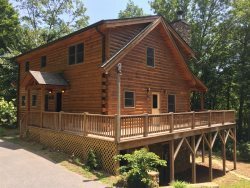 This 4 bedroom, 4 bath cabin has a King bedroom on the main floor. One Queen bedroom downstairs and another room with with 2 sets of Twin bunk beds. Upstairs is the fourth bedroom with a Queen bed. There are TV's in the living room in each bedroom. The bunk bed room has an Xbox with plenty of games and a DVD player. Have a lively game of Ping Pong and enjoy your favorite music in the loft using the CD Player and Blue Tooth Speaker system. Take in the views of the Smoky Mountains from the deck, grill out on the gas grill and relax in the hot tub after making Mountain Memories around the fire pit. AWD or 4WD is highly recommended to access this cabin. It was an honor to be the first here. Thank you owners. You will get more of my money. I will love to come back. I love this place!